I-5 Southbound - On I-5 southbound just south of SR 18 (MP 142) there is a collision partially blocking the HOV lane. Tow Assistance and the State Patrol have arrived on the scene. 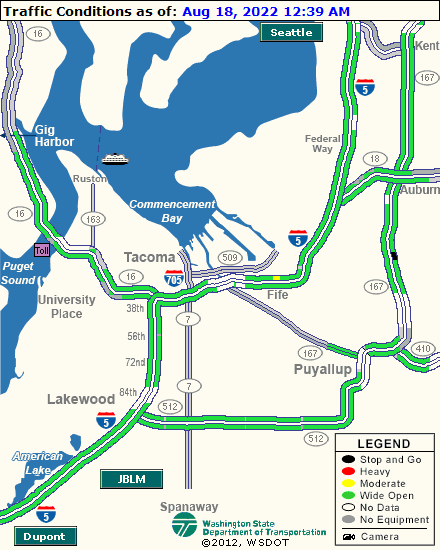 I-5 Southbound - Road work on I-5 southbound from milepost 135 near E Bay St/SR 167 to milepost 134.6 near East "L" St beginning at 9:18 pm on April 23, 2019 until about 6:00 am on April 24, 2019. I-5 Northbound - Road work on I-5 northbound at milepost 120.88 near Joint Base Lewis-Mcchord Main Gate beginning at 8:50 pm on April 23, 2019 until about 4:30 am on April 24, 2019. SR 7 Northbound - Road work on SR 7 northbound at milepost 48.07 near 180th St S beginning at 8:17 pm on April 23, 2019 until about 4:00 am on April 24, 2019. SR 161 Southbound - Tuesday, April 23, to the morning of Thursday, April 25 - The left lane of southbound SR 161 between the I-5 overpass and SR 99 will be closed from 9 p.m. to 5 a.m. nightly. SR 181 Northbound - Monday, April 22, to the morning of Thursday, April 25 – Northbound SR 181 between West Meeker Street and West James Street will be closed from 9 p.m. to 5 a.m. nightly. A signed detour will be in place.